The design structure of links of computer nodes is defined as network topology. It could also be characterized as the way in which the elements of a network are mapped or arranged. Network topology basically depicts the configuration of a communication network. Here the term “Configuration” means the the physical and the logical interconnection between the different nodes of a network. Network topology could be categorized into 3 types,namely – Physical,Logical and Signal topologies. Physical topology describes the physical design of a network. Signal topology traces the paths of the signals over the network. The mapping of the paths taken by data as they move over the network is defined as a logical topology. Signal topology and logical topology are almost similar. There are 7 fundamental network topology types,viz. All elements of the Bus topology network are linked to a common transmission medium with two end points. All signals, that move over the network, are transmitted through a common transmission medium, called bus. In Star topology network, all nodes are linked to a central node, called hub. The signals that travel back and forth between the nodes, always pass through the hub. 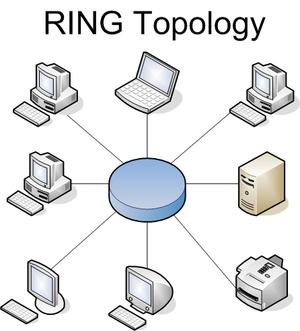 Every point in the Ring topology network is linked to 2 other points and the first and last points are linked to each other. In Tree topology network, there is a central node, that is linked to one or more nodes of a lower hierarchy. Each network element is connected to every other element in the Mesh topology network. A hybrid topology network is a combination of two or more basic network topologies, such as a star-bus, star-ring, or tiered topology. In point to point topology network there is a permanent link between two nodes. Conventional telephony is an example of this topology.